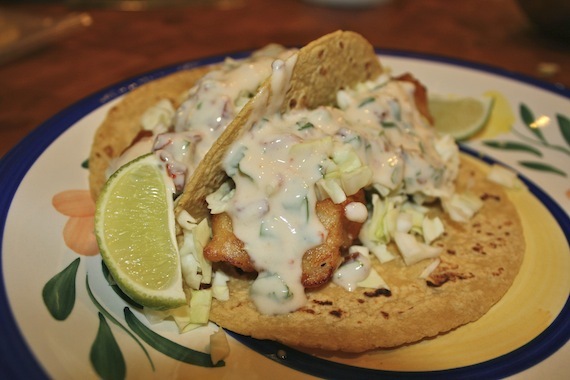 After visiting my sister a few times back when she lived in San Diego California, I developed a love for fish tacos. This was way back.. before fish tacos had become more or less mainstream fare you can find at almost any Rubio’s street corner dive. I remember that my first impression was of strange surprise when I first learned of them. Fish tacos after all don’t sound inherently delicious when you are first introduced to them. That is until you take your first bite. The crunchy fried fish, the tangy sauce, lime juice, and cabbage. From that point on, I’ve been hooked. I like to bring a little more spice to my version by adding a little chipotle to the sauce. Using a medium to large pot, bring about 4 inches of oil to 350 using a candy thermometer or frying thermometer. Meanwhile, in a medium bowl mix your beer and flour and season with salt and pepper. Prepare fish by cutting into chunks about small chunks. Submerge in beer batter. In another small bowl combine cabbage, yogurt, and chipotle. Salt and pepper the sauce, set aside. Once the oil is heated to 350, fry about half of your fish. Keep in fish in the fryer until golden and crispy, about 4-5 minutes. Drain on paper towel and repeat with remaining fish. Prepare tacos using a couple pieces of fish, a couple tablespoons of yogurt sauce, some cilantro and a warm tortilla alongside a lime wedge. Enjoy.